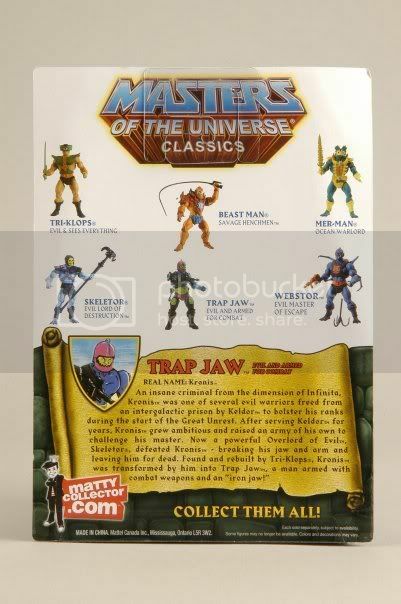 As Toyguru promised, Trap Jaw will be re-issued this August. 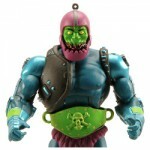 Trap Jaw is available for sale at MattyCollector.com on August 16th. I think he might give Scare Glow a run for his money as being my favorite figure! he just might,ive been looking foward to him since sdcc,i think he is the reason i started collecting this line.And why is scareglow alot of peoples favorite(or top 5), webstor is still my favorite right now. I love my Scareglow because of the detailing in the figure itself and the accessories it includes. 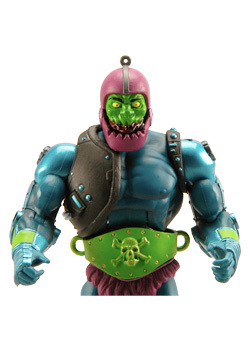 Trapjaw is the first fig I'm thinking of buying double, so I can have him also displayed as Kronis. Probably my favorite MOTU character ever. Also happened to be the second MOTU figure I ever owned, right after He-Man. This might be my first Classics purchase, if I have the scratch for it at the time (and the timing). 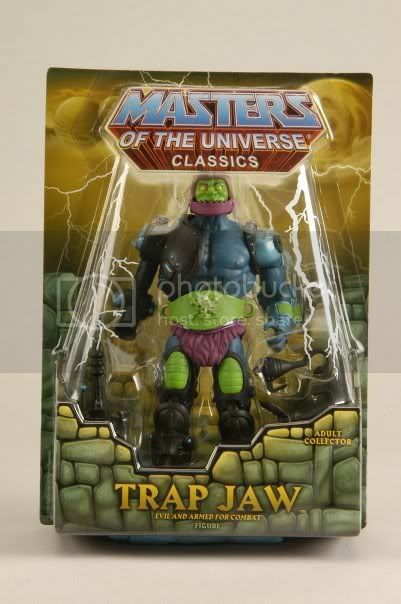 Trap Jaw sold for $68 on ebay! Trap Jaw + Battle Cat sold for $177 on ebay! You know what's funny, when I got Hordak and decided I really didn't want him after all, I tried selling him on ebay and the auction ended at 12 bucks. Thankfully I had a reserve, but I'm surprised these are going for so much. What month did you sell your Hordak in? When I ordered Hordak, I accidentally ended up with a double order. I was able to sell one Hordak on ebay for $40 last June. I saw a Hordak auction from Hong Kong that sold for $250, 2 weeks before Hordak was officially released through MattyCollector. I tried right after I got him in hand. He didn't come in a white box, just a brown shipping box, and I tried him on ebay and got less than what I paid. Thank god for reserves! Trap Jaw re-issued this August! I think I will have to get him this time around.